If it is often said that knowledge is equal to power. While this statement cannot be universally applied (and in fact is somewhat cliché), it reflects an important truth regarding today’s digital world: consumer values are evolving. Data is more readily available than ever before. Communication methods are changing. Success in today’s technology driven world directly correlates to the quantity and quality of information possessed… that of the client, the competitor and the market. Informed decision-making ultimately leads to greater access, opportunities and technological advancement. The difference between renewable success and ultimate failure is a fine line that most ambitious businesses are willing walk. Very often, the most important factor in determining success comes down to who engages in factual and informed decision making and who follows hunches and suppositions. What is one strategic business intelligence (BI) mechanism that is absolutely necessary in the digital age? A BI dashboard. How can you create one? 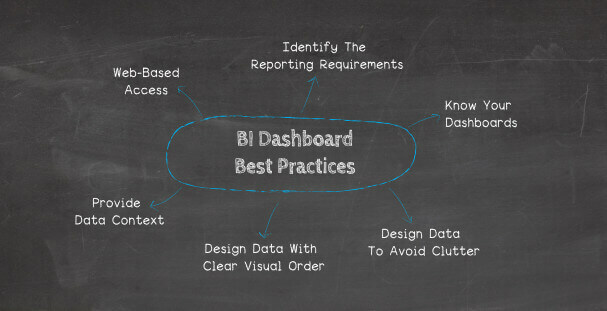 Thanks to specific business intelligence best practices for dashboard design. Let’s take a look! In the following article, we will first go over the definition, importance and benefits of a business intelligence dashboard, and move on to some important BI dashboard design best practices you should consider when making one. Finally, we will illustrate them with a real-life dashboard that followed the advice. Get our free guide with great tips for your BI dashboard implementation. What Is The Definition of A BI Dashboard? A BI dashboard is an information management tool, that uses data visualization to display KPIs (Key Performance Indicators) and metrics tracked by a business to assess various aspects of performance. They are basically a tech-driven approach used to analyze and visualize information in an actionable way. Business intelligence dashboard design consolidates charts and graphs on a single screen, providing the reader with a big picture of the situation it is assessing. A BI dashboard doesn’t have a fixed, determined nature and adapts to the needs of the people building it, by displaying the metrics relevant to their function and industry. They can have a lot of different features, mainly being a customizable interface, a certain level of interactivity as well as the possibility to pull data in real-time from multiple sources. By enabling the user to visualize otherwise complex and heavy raw data, they simplify the data processing for our brain and give readers an at-a-glance overview of the current performance. The basis for factual and informed decision making is real-time data analysis. It is the by-product of both human and financial capital investment and takes the form of strategic business intelligence. From measuring budgetary efficiency, to determining market trends, to understanding consumers real-time data analysis allows digital age businesses to easily identify the key performance indicators driving today’s markets. What Is The Purpose Of A BI Dashboard? The purpose of any BI dashboard is to help business users make better-informed decisions by letting them gather, consolidate and analyze their data – and of course visualize it in a meaningful way. They aim at simplifying a complex analysis of huge amounts of data, to avoid missing any trend or pattern. Often enough, they are overlooked or unspotted in an infinite table of numbers and figures, and the potential of such data remains untapped. Trend identification: dashboards allow businesses to identify and activate positive trends while simultaneously isolating and correcting negative trends. Increased efficiency: decision-making should be based on available data. Dashboards improve efficiency by providing real-time data of good quality that let you make informed decision as soon as needed. Self-service tool: modern dashboard software can be implemented easily and without requiring specific IT skills. They can be shared quickly, providing agility and mobility that traditional data processes cannot match. The number one goal of a dashboard is to inform its audience… and it is a purpose we share here at datapine. As dashboards are part of the continuously evolving landscape of technological data solutions, it is important to shed light on the standard best practices for their use and implementation. Remember, knowledge is power… and power will present access, opportunities and technological advancement for your business. Why Is A BI Dashboard So Important? BI dashboards cohesively organize data and alleviate potential clutter that can arise when applying advanced intelligence tools. Using highly visual data representations and tools, business intelligence dashboards produce graphs, charts and other visualization instruments that allow data to be easily interpreted and analyzed. Advanced business analytics tools come in all shapes and sizes. From data mining, to spreadsheets, to local information systems each available data solution plays a different role in maximizing value creation. 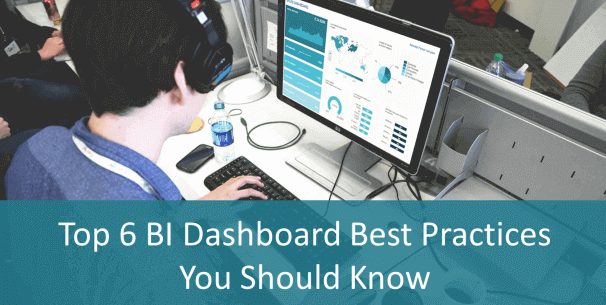 In order to build the best of them, let’s now take a look at some BI dashboard best practices. BI dashboard best practices refer to methods and techniques made and recommended by BI experts and data scientists to get the maximum value out of your dashboards and reports. Let’s go through 6 of them we find essential. Like you would do for any type of reporting – management, financial, marketing, etc – the first thing you need to clarify are the “Ws”: why do you need to report, and to whom? List all the stakeholders involved as well as the decision-maker and end users. Once your target audience is defined, you will have a better idea of what will be on your dashboard. Indeed, knowing who your readers will be will help you focus on specific aspects of the data that is relevant to them, to their needs, that matches their expectations and technical skills. To do so, you can schedule phone or face-to-face interviews with the different stakeholders to consolidate all of their reporting requirements. When this is done, it will be much easier for you to choose from lists of KPI examples the ones that will fit your audience best. Remember that the purpose of BI dashboards is to see reality clearly, so that you can make the right decisions at the right time. The data analysis questions you’ll ask will provide a framework and allow you to focus on specific aspects of your business performance – and that’s when the KPIs come in. Pick the ones that translate the status of your business the best and that measure the evolution of your process towards your goals correctly. To learn more, check out our article on what are KPI reports. Before selecting a specific dashboard design, it is important to know what types of traditional dashboards are available. Once you understand each type, you can make an informed decision regarding the purpose and implementation of your dashboard. Remember, informed decision-making for maximum ROI is the whole point! Strategic: Strategic dashboards aggregate key organizational health indicators and help C-suite executives identify opportunities for organizational expansion. They detail the general health of an organization, not for the purposes of a complete analysis, but to provoke future thought and further independent analysis. The analyses are not overly complex and typically include more general data aggregations compared to other data dashboard solutions. Analytical: This type of dashboard is engineered to provide detailed data analyses pertaining to data trends (the what, the why, the how). Analytical dashboard solutions place a particular emphasis on measuring data variables in relation to time (week, month, year, etc.). An example would be to conduct an analysis of supply chain management, together with product sales, over a designated period of time in order to determine what trends, mutually dependent factors and potential strategic consequences exist (if any). A great analogy for analytical dashboards would be that of a general medical practitioner. He or she may not be an expert in one specific medical field, but they can effectively monitor the overall health of the body by comparing current symptoms to what would be an ideal state of health. This is exactly the role of analytical dashboards. As analytical dashboards take into account a multitude of different measurables for the purposes of aligning goals with performance, they have a tendency to be complex and highly focused. Operational: Where analytical dashboards monitor the overall health of an organization, operational dashboards focus on KPIs. They will vary depending on industry and audience (sales, marketing, finance, etc. ), but they will always monitor the real-time operations of an organization or entity. Rather than analyze the general health of an organization (or “body”), operational dashboards will specialize in monitoring the functionality (and deviations) for various KPIs (or “organs”) that exist within an entity. As an operational dashboard provides real-time information, they tend to contain less complex data. Once you have given thought to and selected the type of dashboard you desire to implement, the following business intelligence dashboard best practices suggest that you should begin focusing on concise and effective design. While an “easy on the eyes” design scheme may appear tempting, effective communication should always be your number one priority. It is a major fallacy to assume that what you think is a more visually appealing dashboard will communicate more effectively with your data audience. Communication is a science, and business intelligence dashboard design should reflect quick, concise and clear fact-based communications. One of the unfortunate tendencies of data professionals in the digital age is the self-defeating habit of overburdening audiences with clutter. This is why you should follow the 5-second rule, that states that your dashboard should provide the relevant information in about five seconds. While its forms vary, the inherent nature of clutter will likely always remain the same… it will occupy cognitive space within the mind of the audience, and yet, simultaneously fail to have any substantive or beneficial impact. Not only will clutter fail to have a positive impact on an audience, it will create the appearance that data is more complex than its true nature… To avoid clutter, you must identify clutter. A great guide to identifying the characteristics and forms of clutter is the Gestalt Principles of Visual Perception. These six principles (discussed below) were defined by the Gestalt School of Psychology as the main principles outlining basic human interaction and order creation within the context of visual (i.e., data) stimulation. Let’s briefly take a look at each principle. Proximity: The principle of proximity dictates that we tend to group elements together based on their location or “proximity.” This principle allows for the manipulation of perception through well placed and cleanly grouped data. Similarity: The principle of similarity dictates that we are likely to group comparable elements together. This essentially means that from the visual perspective of the audience, similar colors, shapes and fonts are expected to be grouped together. When applied to client communications, this principle can assist with the removal of unnecessary data elements. Closure: The principle of closure refers to our propensity to “close the gap” and create complete elements. This concept applies even when portions of shapes and figures are missing. Enclosure: The principle of enclosure dictates that if elements are controlled by a visual border or shading, we will tend to see the objects and elements as unique groups. Like prior principles, this principle can be employed as a foundation for graphical data presentation. Continuity: The principle of continuity dictates that if separate linear elements are positioned within one another, we will tend to integrate all of the parts of the elements. Individual lines will then be viewed less as separate and more as a continuation of one central element. Connection: The principle of connection dictates that our visual pairings are often strongest when there is an actual linear tie. That is, rather than associating elements via color, shape or spacing, we will use a direct lineal connection to establish the foundation for our visual relationship with data. To find out more about design principles, read our article on dashboard design pinciples. One of the most influential factors impacting dashboard data analysis is the subconscious desire to achieve visual order. Disorder begets disorder, and if we fail to appreciate the value of a clean and clear data presentation, our data disorder will ultimately result in dashboard disorder. 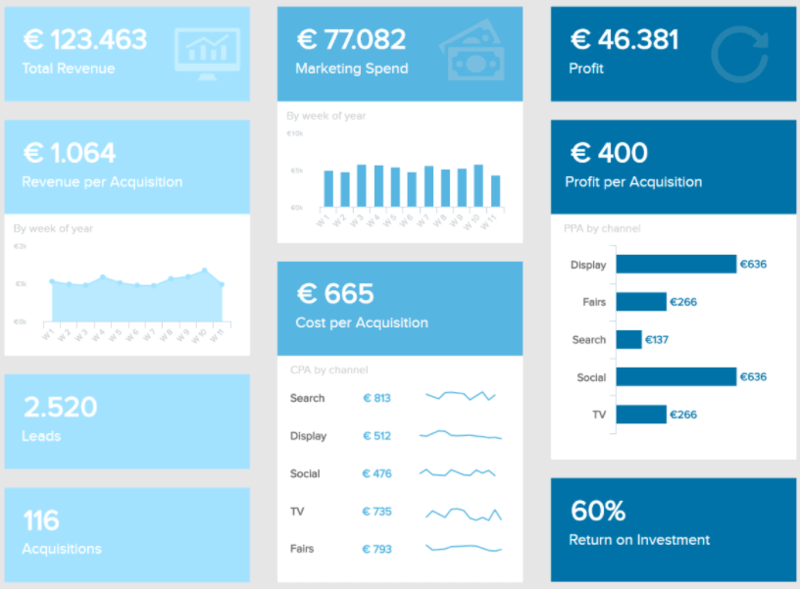 Let’s take a look at the elements of a well-ordered dashboard engineered for visual success. Consistent Alignment: Ideal data alignment for dashboard purposes is likely to be determined on a case by case basis. A good default rule is to have your dashboard data positioned in upper left. Alignment: It is important to remember that the basic information consumption pattern for an audience normally will be to start in the upper left corner of the page and read down in an “F” pattern. For this reason, the upper left corner of the page is likely a leading candidate for informative text. Knowing what to place and where is as important as knowing what not to place. Therefore, a second general rule is to avoid ALL temptation to place diagonal elements and fill patterns. Diagonal data elements, especially those linear in nature, add little benefit while significantly reducing alignment efficiency. Use of Contrast: Contrast should be viewed as closely related to white space. Both originate from the same family tree, but each one brings its own unique properties and features. You can, and should, experiment with both contrast and white space together. When combined, they have the potential to create an incredible one two visual punch. More often than not, contrast will be applied via a change in the data color scheme. This change, likely to be focused on a “point of emphasis” element, is intended to draw the viewer’s attention to a specific and important data detail. Simple color and design variations will enhance the information gathering process and allow for an efficient, focused and comfortable data experience. In order to properly analyze the role of data within a specific dashboard, everyone from the CEO to a first-year product salesperson needs to understand the notion of context. Data analyses and visual representations lacking data context will be limited in their utility and ROI. It is normal for data points to generate more questions than answers. However, data observers should be fully informed nonetheless. For example, if a dashboard is monitoring product marketing effectiveness, and one of the data points included is total sales, this data point will be useless without knowing the measurement time frame. Is it this week? This month? This quarter? This fiscal year? Absent time specific context, it is next to impossible to know the intended significance of the data. A second but equally important part of context is currency. Selected data metrics must be up-to-date in order to reflect current trends and challenges. If not, there is almost no point to any analysis. Data arriving to the party out of date creates a margin of analysis error that is a slippery slope. Data rooted in past circumstances is bound to create “fact-based” decisions that are no longer representative of current business environments. While the expectation isn’t (and shouldn’t be) minute-by-minute updates, data metrics should put your business in the best possible position to make informed decisions. For that to happen, data points should remain relatively current. Our final best practice is a matter of technological advancement, but also preference. In today’s digital age, with the demand for real-time data updates, an online dashboard is a must. Web-based data sharing and analyses reach a wider audience and allow for greater collaboration with other data solutions. File based publishing is an option if budgets and capabilities are limited, but this will negate one of the greatest advantages of BI data dashboards remote synchronization. When in doubt over which storage technique is right for your business, be sure to test each strategy and determine which system of implementation aligns more seamlessly with your organizational needs, capabilities and goals. Remember! The ability to share real-time data dashboards on web browsers, TV monitors and mobile devices will grant your business the data visibility it needs to stay in control of opportunities and trends. From data storage, to real-time Information delivery, to convenience… web-based dashboard solutions will seamlessly align with the need for mobility and flexibility in today’s business landscape. Business intelligence dashboard design aims at communicating the key numbers in an understandable way while keeping the possibility to drill-down for more details. It deals with prioritizing the right metrics, personalizing the content to the reader(s) and avoid clutter. We have a strategic dashboard that collects key financial health indicators for the marketing department. It is a big-picture dashboard typically designed to C-suite executives that does not focus on specific marketing aspects (i.e. the numbers of clicks or impressions, the email open rate, etc). Instead, the financial metrics displayed provide top managers and investors with the performance of the department over time and help them determine where their marketing dollars should go in the future. The design is consistent with several shades of blue that do not clash with each other, while the graphs and figures displayed are not cluttered and follow a clear visual order. The message of that dashboard is understood in a glance and the alignment and white space give a rest to the eyes, who are not struggling in getting to the point. Why Do We Use Dashboards? Dashboards are effective tools for fostering growth in the digital age. With informed data decision making abilities, businesses can continue to advance with the digital age. Follow these six business intelligence best practices for dashboard design and you will be well on your way to harnessing the power of informed decision-making. To benefit from the many advantages a dashboard holds and communicating the insights you gleaned in a meaningful way, why not giving a try to our 14-day free trial? It only takes a couple of clicks to set it up and you are ready to build professional BI dashboards!